Wyoming. The home of vast ranches, robust longhorn cattle, the Big Horn Mountains, and really amazing Thai food. Wait…what? Thai food? Yes, Thai food. I admit I don’t know that there is an abundance of Thai eateries out there on the range, but sometimes when traveling, you just stumble on something completely unexpected. When my mom and I took a trip out to Washington in September, we had planned to spend a couple of days in Cheyenne, Wyoming. We have driven through the northern part of the state a few times before, but we wanted to see what the southern route held for us. The evening we made our way into town, we hurriedly checked into our hotel and began searching on our smartphones for a well-loved local gem. We settled on a Thai restaurant called Anong’s. Trying international cuisine is a roll of the dice sometimes. I feel like a lot of places try to tone down flavors because the establishment thinks that’s what the local citizens want. I need a full flavored, make-my-tongue-dance experience! Take me on a tour of your country through my taste buds! Don’t dull my food please. I can get dull food at a Taco John’s or China Buffet. 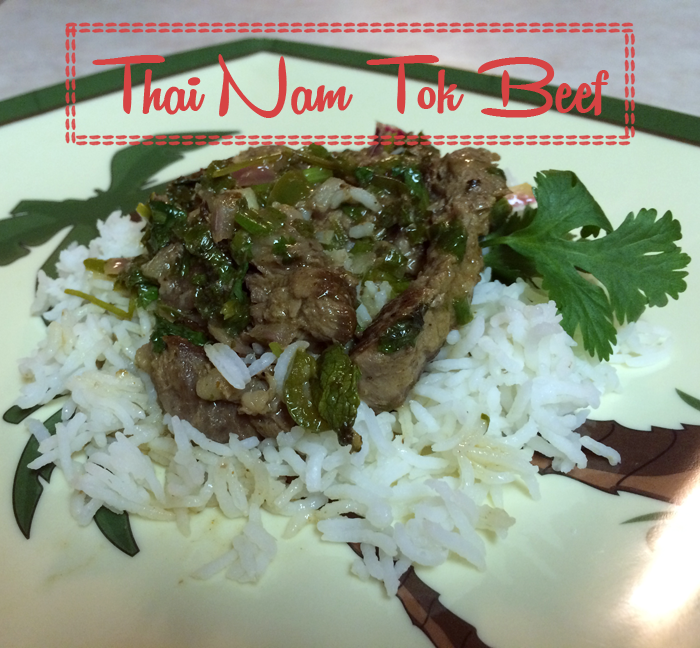 A dancing tongue dish at Anong’s is Thai Nam Tok Beef. I cannot describe how mouthwatering this beef was! I must say, in Wyoming, they know how to cook their meat! It’s perfectly charred on the outside, tender and juicy inside. Nam Tok is sliced beef in a lime and chili pepper mixture and topped with red onion, cilantro, and scallions. Anong’s served it atop a few salad greens. Welcome to the first segment of “First Week Foodie,” a regular monthly segment of the Rangeeli Chick blog where the first week of every month I showcase one or two recipes I have never tried before and make a few changes or additions. 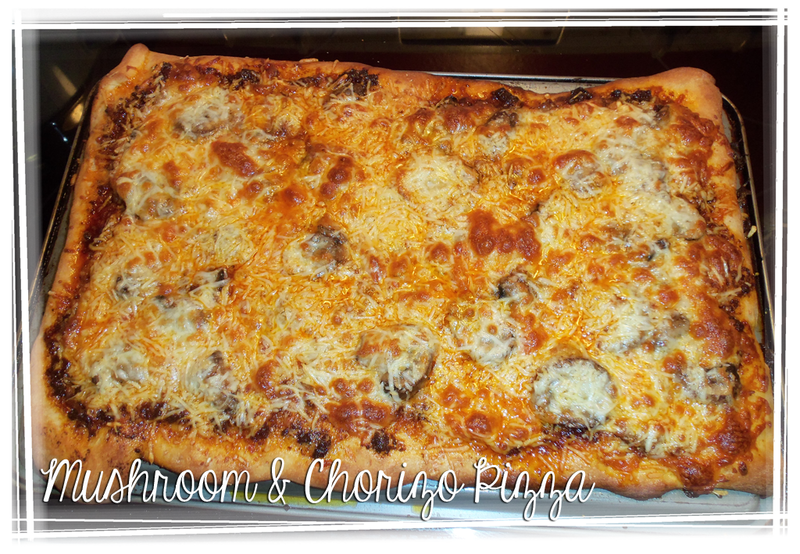 The June installment kicks off with Mushroom & Chorizo Pizza. I haven’t had chorizo sausage in a long time, and for some reason, I had a craving for this spicy and salty meat. There are both pork and beef options. Both taste good, but I tend to always lean more towards the beef variety. But what did I want to do with it? 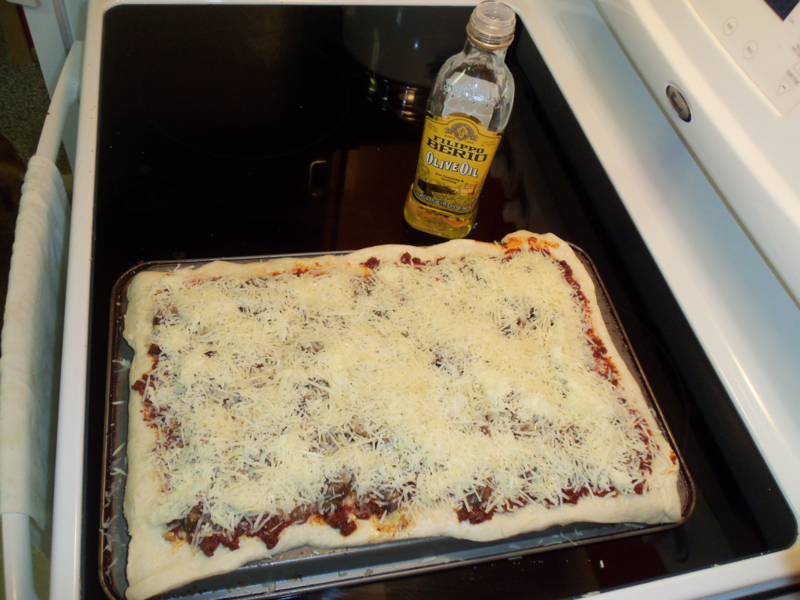 I hadn’t had some really good homemade pizza in awhile, so I went to searching for a fairly easy recipe. The original recipe is courtesy Chow.com, and I also pinned it to my Favorite Recipes Pinterest board. I will post the full recipe below with notes on what I did differently. First, you will want to pre-heat your oven to 450 degrees F. Place an upside down cookie sheet on a middle rack. No, this is not pizza sauce my friends! This is that delicious chorizo. Squeeze it from its casing into a fry pan and begin browning it on medium-high heat, stirring occasionally. Brown it for about 7 minutes. It will still be fairly red in color when it is finished cooking. 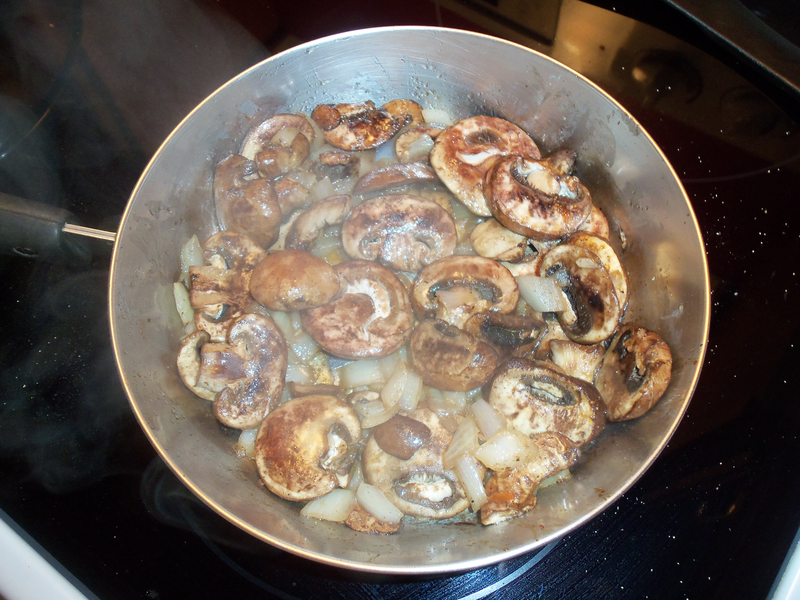 Saute the mushrooms, onion, and minced garlic (as much or as little as you like), after adding about 2 Tbsp. of olive oil to the pan. Season with salt and pepper to taste. Stir occasionally until the ingredients begin to brown. This should take about 10 minutes. Then, take your cookie sheet out of the oven to prepare your pizza crust. Roll out your dough, drizzle the still upside down cookie sheet with some olive oil. Place your dough on the sheet. Spread the chorizo on the dough. Follow it up by distributing the mushroom, onion, and garlic mixture on top. Next, we top it with the cheese! I am a cheese addict, so I pile on whatever cheese I have handy. The recipe called for Jack and Parmesan, but I had to improvise in the absence of the Jack. I used Mozzarella Then, drizzle some olive oil over the top. Place the cookie sheet in the oven for about 10-15 minutes. It depends on the dough you are using and the thickness. 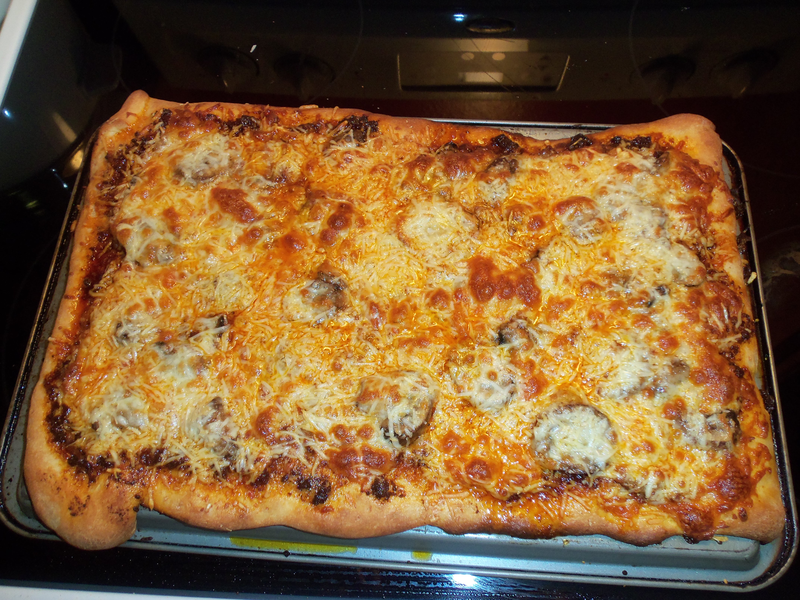 I used Pillsbury brand pizza dough and the edges turned a bit dark by 12 minutes, however, it wasn’t overdone. The temp was also a bit high. Just monitor the dough and be sure to check the baking instructions on any pre-made dough you use. The final product tasted amazing It had the perfect amount of spice in the sausage, and the mushrooms added a nice chunkiness to the toppings. The additional garlic and onion incorporated extremely well with the other flavors, and was the perfect complement. Below is the recipe with extra notes. Pizza is a pretty easy dish to make, and it is extremely customizeable Everyone has different tastes and it is fun to experiment with different flavor combinations! Total Time: About 45 min. Servings: 6-8 Approx. One 10 oz. Package Chorizo (I only used 7 oz. on the pizza). 3 Tbsp. Olive Oil (Use more if needed for drizzling). 1/2 Cup Jack Cheese (I used Mozzarella). Sliced Baby Bella Mushrooms (It called for Cremini, but use what you’d like and as much as you’d like). Pre-heat your oven to 450 degrees Fahrenheit. Place an upside down cookie sheet on a middle rack. 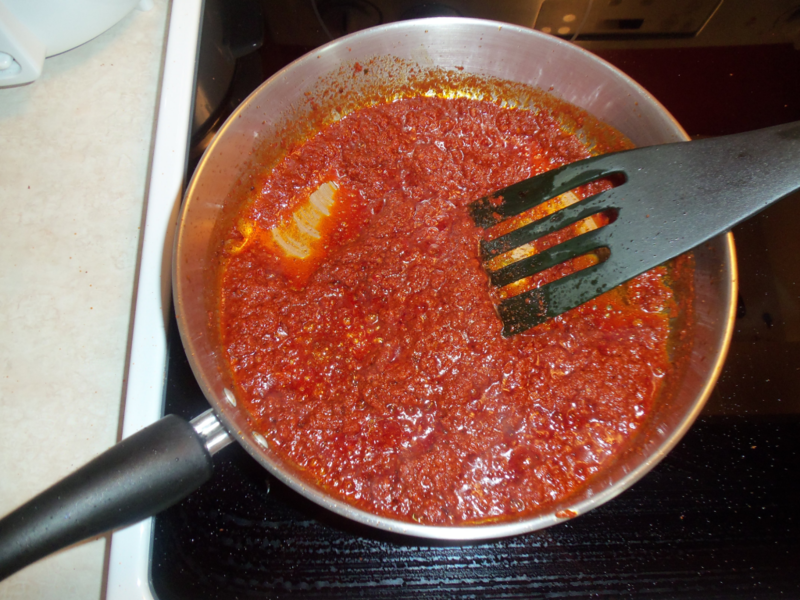 Remove chorizo from its casing into a fry pan and begin browning it on medium-high heat, stirring occasionally. Brown it for about 7 minutes. It will still be fairly red in color when it is finished cooking. Saute the mushrooms, onion, and minced garlic (as much or as little of these ingredients as you like), after adding about 2 Tbsp. of olive oil to the pan. Season with salt and pepper to taste. Stir occasionally until the ingredients begin to brown. This should take about 10 minutes. 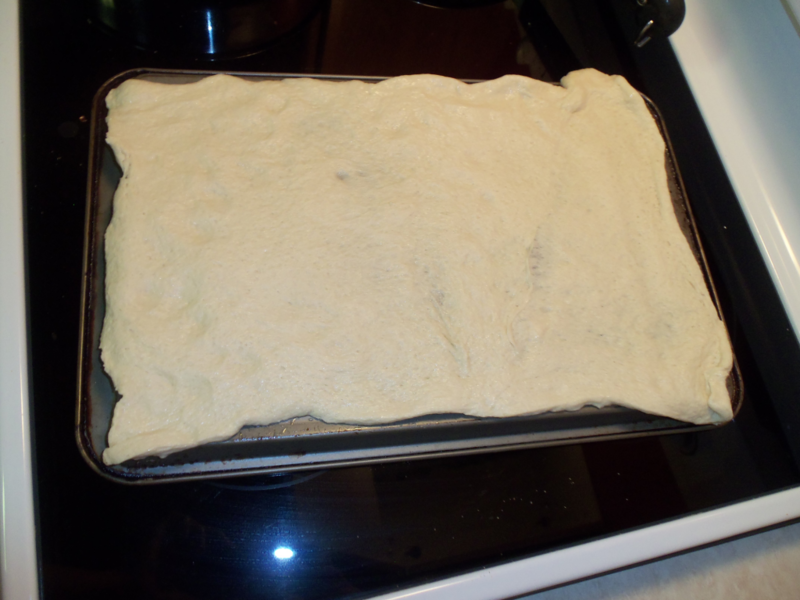 Then, take your cookie sheet out of the oven to prepare your pizza crust. Spread the chorizo on the dough. Follow it up by distributing the mushroom, onion, and garlic mixture on top. Add your cheeses on top and drizzle with about a Tbsp. of olive oil. 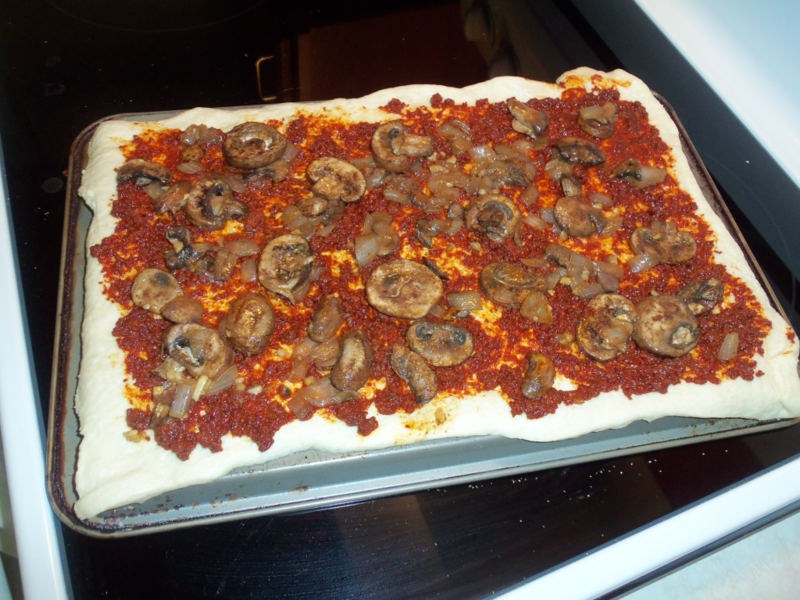 Place pizza in oven as per dough instructions. Check the pizza periodically to get desired results.